Lovely hand made pruning saw. Sorry, no longer available. Please contact us for help and alternatives. 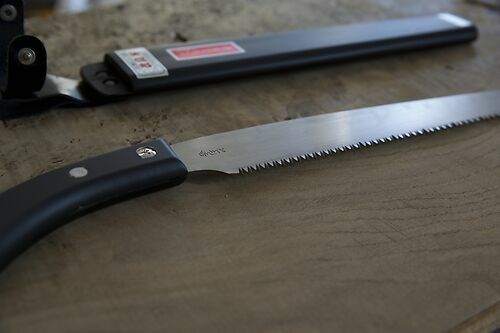 Traditional Japanese Pruning Saw - amazingly light and delicate, with a very flexible blade - ideal for careful garden and tree pruning. Fine teeth can handle soft and hard woods. Even more so than other Japanese saws, this needs treating with care, being sure not to twist, catch or pinch the blade - but it's worth taking the extra care, as it's a real beauty.